The Zimbabwean government has launched its nationwide urban transport service to try and cushion commuters from high taxi fares. Government has deployed armed soldiers and details from the police para-military Support Unit to man buses carrying passengers after last week's fierce rioting saw cars torched by angry protesters during a national job stay away. This following the reintroduction of ZUPCO and other branded buses into the country's urban transport system in the wake of private commuter omnibus operators either withdrawing their fleets out of caution or hiking their fares in response to recent fuel price increases by government. The buses were re-introduced with lower fares on Monday to counter a hike by kombis that have dominated the industry since the government run urban transport system went defunct over a decade ago. On Monday, some buses were observed being accompanied by at least two armed soldiers and a member of the police Support Unit. This comes amid weekend calls by faceless social media characters for locals to embark on another job boycott to maintain pressure on government so it could give in to citizen demands. Last week's stay away, which was called for Monday to Wednesday by the Zimbabwe Congress of Trade Unions and social movements, witnessed wild protests by locals who were angered by government's decision to hike fuel prices by more than double. The military was called in to quell the protests and to also hunt down alleged perpetrators of the skirmishes in an operation that left 12 dead, according to independent estimates, and dozens seeking treatment for gunshot wounds. Meanwhile, kombi operators were Monday forced to slash their fares by half following the government's decision to counter their exorbitant charges. Commuter omnibuses were now charging between $2 and $4 for a trip from the Harare CBD to city suburbs which are within the range of 5 to 20km. 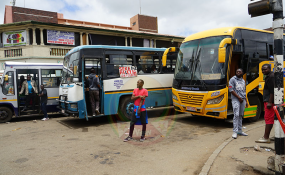 Hard-pressed Harare commuters who spoke to NewZimbabwe.com on Monday welcomed the new public transport arrangement being supervised by government's transport operator ZUPCO. "This is a good move... the majority of the people are happy because kombi operators have been overcharging us. "How can a fare for one passenger be more than the price of 1 litre of fuel? That is unheard of!" said one Edmore Tirivanhu. Private operators however felt that the introduction of buses with bigger carrying capacity was not the solution to the current fare instability and fuel crisis. "This is not the solution at all. They should first fix fuel shortage problems and pricing issues. This is a temporary solution by the government. Soon we will be back to square one," said Denford Machokoto, another kombi driver. Government says it has introduced 158 buses for Harare to carry commuters who have been at the mercy of unscrupulous kombi operators.